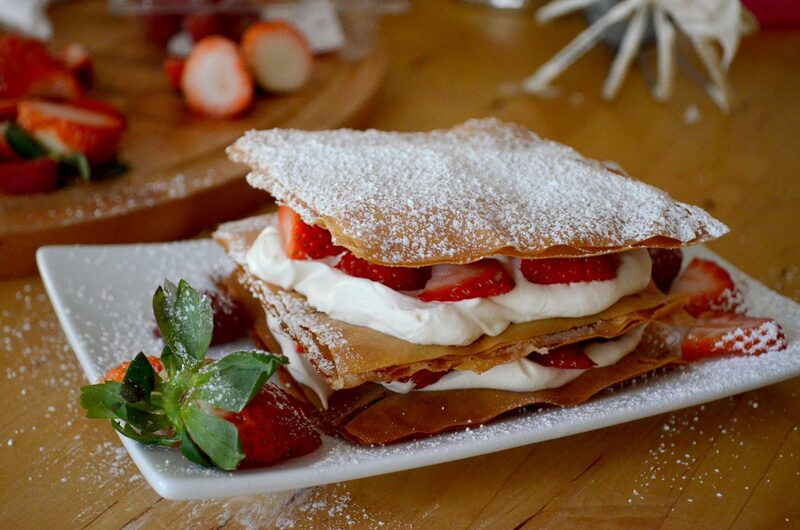 My mother has been making these Napoleons for the past ten years, and they are still one of my favourite desserts. They are not very difficult, look very impressive, and are absolutely delicious. Asked for by guests time and time again, they are definitely one to throw into your repertoire. My mother stacks the layers gently, so they look like they are floating – beautiful and light. I squish mine a bit more to help the fork stab through when eating. That’s the joy of this dessert, there are many ways you can stack the layers to give it your own twist. *Recommended size: 9×14-inch. Phyllo can be found in the frozen pastry section of local grocer. Preheat oven to 350F. Line 3 large baking sheets with parchment paper. Place 1 phyllo sheet on your kitchen counter. Using a pastry brush, brush phyllo sheet with a thin layer of melted butter and sprinkle with 1/2 tsp sugar. Layer with another sheet of phyllo and repeat butter and sugar steps until four sheets thick. Cut phyllo stack into 4×4 inch squares. Transfer squares to prepared baking sheet, being sure to leave space between squares. Repeat with remaining phyllo sheets and transfer them to the second and third prepared baking sheet. Bake until phyllo is light golden in colour, about 5-7 mins. Gently transfer phyllo squares to a cooling rack and let cool. Phyllo squares can be made 2 days ahead and stored in an air-tight container between sheets of wax paper. Beat mascarpone, cream, vanilla and remaining 1/4 cup of sugar in large mixing bowl until stiff peaks form. On each plate, place a single phyllo square. Spread 1 tbs of whipped cream mixture around the square and top with some berries. Place a second phyllo square on top of the first and repeat with the berries and whipped cream. Finish with a plain phyllo square. Dust with powdered sugar and sprinkle remaining berries around the plates.